This metal tapered wand can be connected to another wand and to the hose handle. For use with the dusting brush, crevice tool, and Electrolux metal wand floor brush, among other vacuum attachments. You will need to order 2 wands to make up the full extension. Was sent right away, fits and I am happy to be able to use my old Retro Electrolux! We have an old Electrolux canister vacuum, maybe 35 years old. It had a 2-section plastic wand that broke. 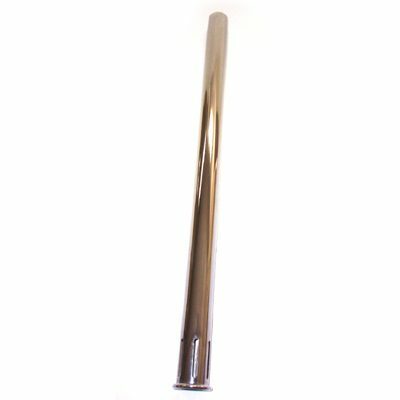 This metal replacement wand is exactly what we needed. The vacuum and new wand should be good for another 35 year. Great product. Great vacuum. Perfect fit for your Electrolux. Looks good nice shinny chrome. Wouldn't buy the plastic ones. This universal wand is a great value and far superior to any of the plastic alternatives. Answer:Yes, this wand will work in place of the plastic wands. You will need two wands to make up the full extension. Answer:This wand will fit the 1205. Answer:This is the attachment wand which is compatible with the Electrolux Diplomat. Answer:The diameter is 1 1/4"